A postcard sent to Rev. R.B. Layton in San Fernando, Trinidad, B.W.I., from 25-year-old Agnes Mary Kitchen, mailed from Paris, 17 July 1910. Travelling is all very nice but sometimes I wouldn't mind being home. This is one of the fashionable drives of Paris. 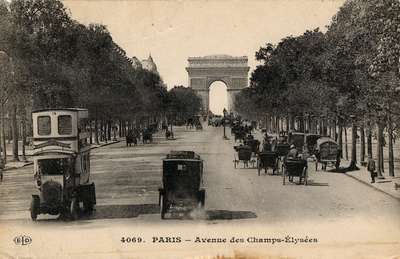 The Arc de Triomphe de l'Etoile, in the distance, is the largest triumphal Arch in existence. It was begun by Napoleon in memory of his victories in 1805-6 but finished by Louis Philippe. Leaving here tomorrow for London.